Sometimes investment opportunities can be found in the most innocuous of headlines. A perfect example of this occurred in the back-and-forth tariff threats between the U.S. and China. One of the Chinese government’s threatened retaliation measures would be to impose tariffs on the most successful export industry the United States has had in recent years – energy. China said it would slap a 25% tariff on imports on U.S. oil, coal and certain refined products. But there is one notable exception – liquified natural gas (LNG). Of course, China may decide to impose a tariff on LNG too, but that is doubtful. And therein lies the tale of an investment opportunity for you. The global LNG market is being turned upside down, all thanks to China’s push to lower pollution. There are a number of measures the government there is enacting to do this and prominently among these is the greater use of cleaner-burning (as compared to coal) natural gas. These moves by the Chinese government has now made the country the world’s second-largest LNG importer, trailing only Japan. It purchased 38.1 million metric tons in 2017, a rise of 46.4% from 2016 levels. Its purchases this past winter pushed Asian LNG prices to a three-year high. And it’s also changing seasonal patterns. 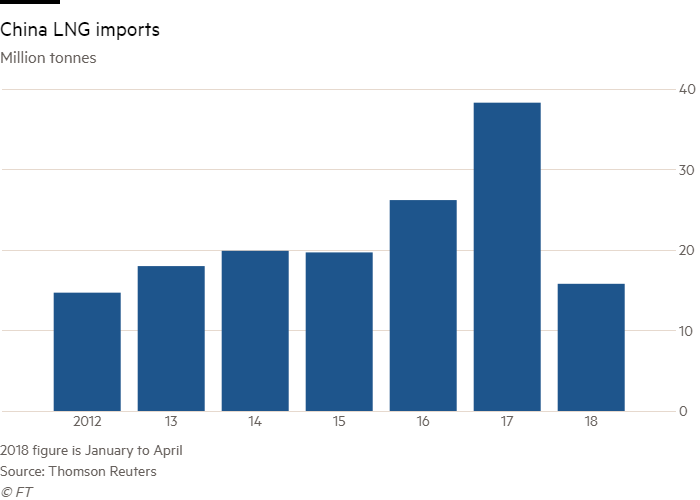 LNG prices normally spike in the cold winter months, with the slowest period being from March to May. But now Chinese demand is boosting prices even during these months. In the first four months of 2018, Chinese buying soared 58% from the year ago period to 15.8 million metric tons. That would put it on pace to import more than 47 million tons of LNG in 2018! That pushed the Asian LNG price to its highest seasonal level since 2014, at $9.60 per million BTU, a stunning 80% price rise from just one year ago. As I stated earlier, this Chinese buying is turning the industry on its head. At the height of the LNG project construction boom earlier this decade, forecasts of a surplus of as much as 50 million metric tons per year at the start of the next decade were commonplace. That construction boom included eight LNG projects in Australia, at least four projects in the U.S. as well as other projects in countries like Mozambique. Now, surplus estimates have been shrinking rapidly, and if Chinese demand continues growing at its current pace, the supposed surplus will turn into a supply deficit. The reason is straightforward – it takes almost a decade to move from a final investment decision to actually being able to produce cargoes of LNG for shipment. A reasonable estimate emanated from the recent Australian Petroleum Production and Exploration Association annual conference of an annual deficit of 50 million metric tons by the middle of the next decade. The finger was pointed at the lack of investment in LNG projects in recent years. Only one very small project in Mozambique was approved in 2017 and very few projects will be ‘shovel-ready’ in time to be producing LNG by 2025. That means the companies that have LNG export-producing facilities already will be sitting in the proverbial catbird seat. There are several companies in Australia that will benefit – Australia will soon become the world’s leading LNG exporter. And France’s Total (NYSE: TOT) has taken a stake in a new Siberian project led by Russia’s Novatek. But let’s look at the U.S. companies that will benefit from China’s new-found thirst for LNG. One U.S. company that is involved in the major LNG projects in the African nation of Mozambique is Anadarko Petroleum (NYSE: APC). It was back in 2010 that the company made its first discovery in the Rovuma Basin, one of the most important natural gas discoveries of the last 20 years. It recently approached its near-term target of getting enough buyer agreements to support its final investment decision to go ahead with its Mozambique project, one of the world’s biggest LNG projects. Anadarko signed a purchasing agreement with two overseas utilities – the U.K.’s Centrica and Japan’s Tokyo Gas for liquefied natural gas from its Mozambique project. It was an innovative non-binding contract for 2.6 million metric tons per year with the two utilities that will ship LNG based on each company’s specific needs. This agreement took the total amount of agreed purchase volumes to 7.7 million tons. Anadarko vice-president Mitch Ingram said the agreement represented a “significant portion of the marketing offtake target “ it had set for its final investment decision. The target was 8.5 million tons. If we look specifically at U.S. projects, there are only six U.S. LNG export terminals approved by the Federal Energy Regulatory Commission that are either operating or under construction. Of these, the company at the forefront here in the U.S. is Cheniere Energy (NYSE: LNG), which is the owner of the first U.S. LNG export terminal (it has been in operation since 2016). 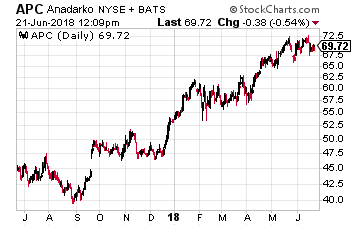 The stock is a portfolio component in my Growth Stock Confidential newsletter and is up 12% since its inclusion in February. I discussed the company more in depth in the newsletter, but I can tell you that Cheniere’s total LNG export capacity is expected to be about five billion cubic feet per day once all five trains are completed (the fourth train was recently completed). An LNG train is a liquified natural gas plant’s liquefaction and purification facility. The company already exports LNG to over 20 countries. And it has finally gotten access to the Chinese market (if politicians don’t blow it) with a first-ever contract. In November, it signed an $11 billion memorandum of understanding for long-term LNG sales with China National Petroleum Corporation. 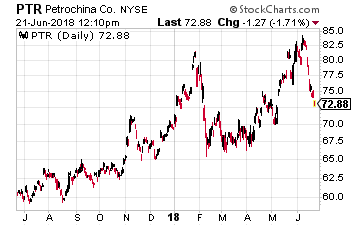 CNPC is the parent of PetroChina (NYSE: PTR). The deal came to fruition when CNPC signed a contract to purchase about 1.2 million metric tons of LNG annually with a portion starting in 2018 and the rest beginning in 2023. The contract runs through 2043 and will be linked to the Henry Hub U.S. natural gas benchmark as well as having a fixed component. 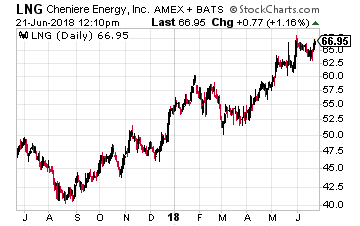 I expect Cheniere’s stock to continue to perform well as will others with exposure to LNG such as Anadarko. China indicating it will not impose tariffs on U.S. LNG tells you they are desperate for more LNG and that looks like an investment opportunity to me. What if I said you could tap the Bitcoin gold rush...without buying Bitcoins. And get in at a TINY FRACTION of the risk other guys face – who could lose their shirts on a bad call or two. And make money no matter which way Bitcoin prices go... up OR down. So you essentially get the best of both worlds. I'll show you how a secret 'backdoor ploy' has just opened up. Giving you the chance to grow MUCH richer... MUCH faster... and MUCH, MUCH safer than by simply buying Bitcoin. You can earn thousands of dollars in 'Bitcoin Dividends'... while exposing yourself to just 1/1000th the volatility. Click here to start collecting 'Bitcoin Dividends'.